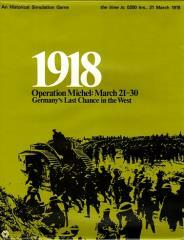 1918 recreates on a divisional scale the first German offensive on the Western Front in that year. This was the first German offensive in France since 1915 (Verdun), and is generally considered the last, and best, chance of a German victory in World War I. The game covers the critical first ten days of the offensive. In addition, to the historical version of the battle, there are various "what if?" options based on certain variables that could have happened almost as easily as the real situation.